We always say great skin is a combination of lifestyle and products. At Handcrafted Beauty we know we have the product portion locked down, but we are constantly looking for ways to clean up our diets and incorporate key nutrients, minerals and vitamins to promote health and radiance. Collagen (which is a protein found in all of the body’s tissues and organs) is essential in maintaining the structure, firmness and elasticity of your skin. Introducing collagen into your diet is a key to skin health, especially as we age and our bodies tend to slow on collagen production. We know how important collagen is to skin health; and there is a assortment of supplements out there with a wide variety of claims. While some of these may be great products we prefer to get our nutrition from food rather tan anything manufactured in a lab (no matter how natural or organic it is). This diligence ensures that any colors, flavors, or preservatives stay out of our bodies. At Handcrafted Beauty we wanted to share a recipe that is not only easy but delicious as well. 1 cup of 100% Organic Juice: we use a combination of 1/2 cup fresh pressed strawberry juice and 1/2 cup store bought Organic Pomegranate juice. *Note- If you do not have a juicer you just use 1 cup of the pomegranate juice. 2 Tablespoons of Grass Fed Gelatin: Image of the Product Pictured below. Bear Gummy Mold: If you don’t want to put them in a mold you can also just dump the mixture in a glass pan. However, we love this mold and pour the set gummies in a glass jar in our fridge for storage. This recipe makes enough for 6 molds. If ordering 6 is not your thing, simply fill the mold you do have and dump the remainder into a glass pan. Add 1 cup of the juice and 1 tablespoon of raw honey to a saucepan and place on low heat, continually stirring the mixture is close to a boil. Remove from heat. In a small bowl add 3 tablespoons of cold water and mix in 2 tablespoons of the Gelatin. Quickly stir and allowing the Gelatin to dissolve. Slowly pour the 1/2 of the water gelatin solution into the saucepan stirring quickly to integrate the gelatin into the juice mixture. Pour the remaining 1/2 of the Gelatin into the juice. Pour or drop the juice molds. Refrigerate for 2 hours. 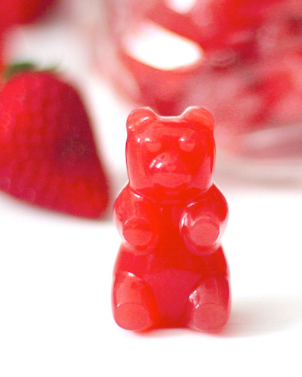 Pop the gummies out of their molds and place into a glass jar with a lid for storage. These will last about 3 weeks). If pouring into a glass pan you will cut 2 inch squares. Not only will your tastebuds thank you, but your skin will as well. with daily consumption have noted changes that include softer, supple and more radiant skin. Combined with Handcrafted Beauty skin care… and it is a real game changer. These are not vitamins, so there is no set amount you can enjoy every day. Since these have a delicious gummy texture and wonderful flavor, these can be enjoyed by all family members any time of the day… in copious amounts!!!!! « What’s all the hype about around Erase Paste?